The location was in Alexandria, VA. The "Take It!" 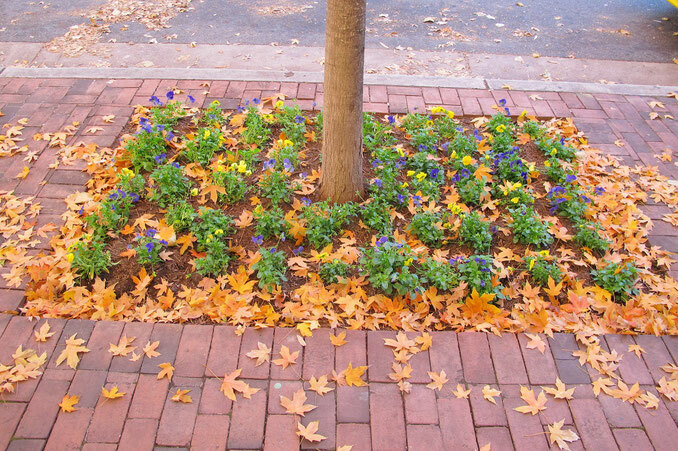 came from walking by this flower box surrounding a young tree and seeing the golden fall leaves in a wind blown border giving this bit of decorative gardening an unexpected upgrade in appearance to a near birthday cake look. This was another " take it like it is " photos even though I was tempted to give it just a little more sorting and shifting of the leaves - lol. The After Take: All who I've shown this to agreed that it had a cake like look to it. Some even expressed their appreciation for my seeing it that way. A few even took it a bit further and had the visible base of the tree be a stand in for a big candle. Even in a rush, sometimes something colorful can reach out and captivate us. Here is hoping you have a similar encounter. Thanks for joining us for the current photo presentation. You are cordially invited to return Tuesday, January 8th for a new picture that we hope you will enjoy. Ya I totally see it. Natures Happy Birthday. I love it! Hahahaha, ya unless you are a deer.